Be the first to share your favorite memory, photo or story of Narrissia . This memorial page is dedicated for family, friends and future generations to celebrate the life of their loved one. 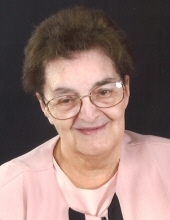 Narrissia “Catherine” Guthrie, 80, peacefully journeyed to her heavenly home, after a hard fought battle, on April 6, 2019. Catherine was born in West Virginia and lived there all her life. Catherine is preceded in death by her mother and father, Noble and Sylvia Lanham; sisters, Wanda Shaver, Madeline Rogers, Ruby Mingin, Margaret Phillips, and Lois Larabee; and one great-granddaughter, Makenzie Francisco. She is survived by her loving husband of 63 years, Jack; sister, Sylvia Hess (J.D.) from Richlands, NC; four daughters, Peggy Thaxton (Darrell), Kathy Smith (Terry), Vicki Brown (Corky), and Melody Snodgrass (Richard) all of Charleston. Catherine leaves behind a host of other family members, and friends, including seven grandchildren, nine great-grandchildren, and one great-grandchild on the way. A visitation will be held at Cunningham-Parker-Johnson Funeral Home, Charleston, Tuesday, April 9, 2019 from 6 to 8 p.m. And one hour prior to service, Wednesday. Funeral services will be 1 p.m., Wednesday, April 10, also at the funeral home, with Pastor David Taylor officiating. Burial will be in Guthrie Cemetery, Charleston. Catherine will be remembered for her joyfulness, her sassiness, and her heart of gold. Although we loved her deeply, we could not take away her pain and can find peace in knowing that she is pain free and reunited with her sisters. We will miss our Mawmaw Cack and will hold the fondest memories close to our hearts for as long we live. We love you more that you could ever imagine and will miss you here on earth even more. In lieu of flowers please make memorial donations to: Kanawha Two Mile Gospel Tabernacle Building Fund, 3807 Edens Fork Road, Charleston, WV 25312. To send flowers or a remembrance gift to the family of Narrissia Catherine Guthrie, please visit our Tribute Store. "Email Address" would like to share the life celebration of Narrissia Catherine Guthrie. Click on the "link" to go to share a favorite memory or leave a condolence message for the family.